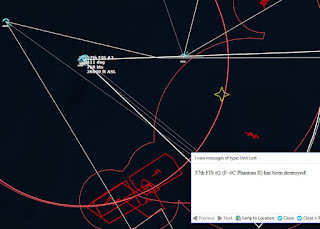 In Part One of this series, I did the mission planning for the Alpha Strikes against Soviet-held Iceland by the USS Oriskany CVBG with USAF assets out of Greenland. In Part Two I began the mission, and immediately had to deal with multiple attacks from Iceland by Soviet forces. In the meantime my USAF Fighter Sweep was refueling and preparing to attack, with the SEAD units behind it, and the B-52s behind them, tasked to destroy the runways. 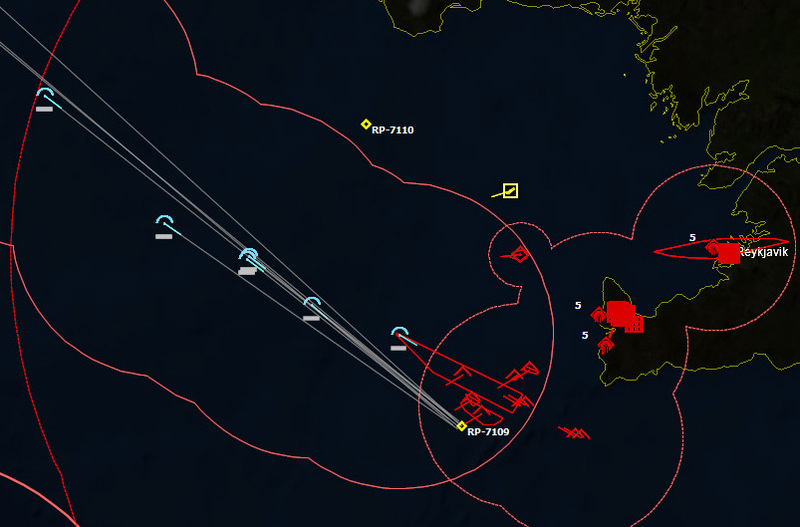 So far I've fended off the attacks with the loss of a single fighter, and now it's my turn to strike. September 12, 1975, 0321Z The B-52Ds at Sondrestrom rolled down the runway, beginning their journey to Iceland. 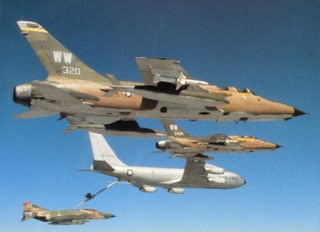 Ahead of them, things were going according to plan as the F-4Cs of the 57th FIS were in position to begin their Fighter Sweep, and the 12 F-105Gs armed with anti-radiation missiles were approaching the tankers. 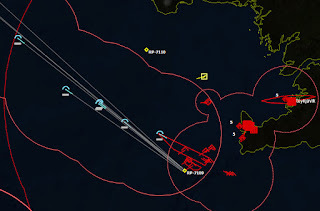 To their south, the Oriskany CVBG had come under constant attack by cruise missiles launched from Iceland and from an attack of Su-24 Fencers. 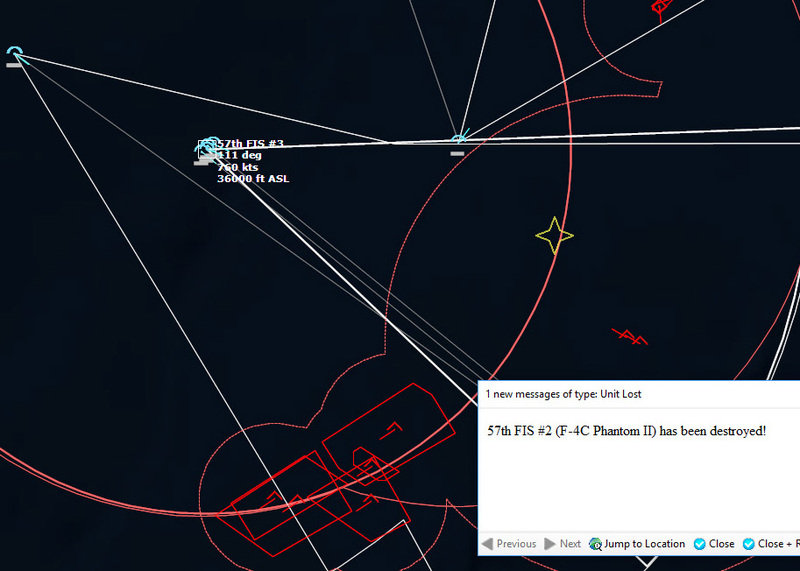 It would be an hour before its own strikes would take off to coordinate the attacks with those of the B-52s. 033307Z "Contact. 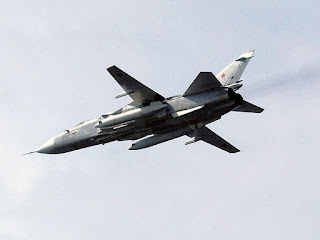 Su-24 Fencer Bravos, two-ship, bearing 105 for 230 miles." "Warning Star, Knight 11, roger. We'll be busy." In the lead F-4C, Major Rogers guided his Phantom towards the Floggers flying a Combat Air Patrol south of Keflavik. Now there were Fencers too. Get rid of the Floggers first, and if they had missiles left they'd take out the Fencers. "Anything, Hickory?" In the backseat of the F-4C, Colonel Jackson had his eyes glued to the scope. "Not yet." "Knight 1, Warning Star. Fencer count is now four." 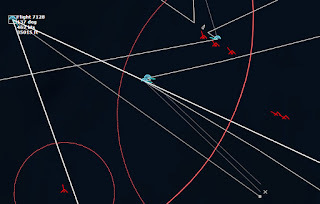 "Contact," Jackson announced, "Buck, I got two Floggers, Bearing 115, 50 miles, Angels 36." "Roger, Knight 12, Knight 11, weapons free. Engage." "They've launched! Missiles inbound, break right!" 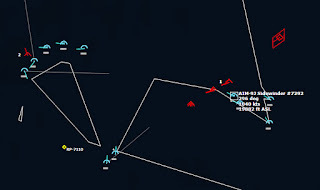 Knight 12 slammed his F-4C hard over to avoid the inbound missiles. The first AA-7 Apex missed the wildly maneuvering fighter, and then the second missed as well. Knight 12 turned in hard, and then locked onto the first Flogger. "Fox One! Fox One!" The first two Sparrows missed, and Knight 12 fired a second pair. "Missiles inbound!" called Knight 12's backseater. "Apex inbound! Break left!" Jackson yelled, and was immediately slammed into his seat as Buck yanked on the stick and pulled the F-4 into a 5-gee turn. "Fox Two!" Knight 12 called out. 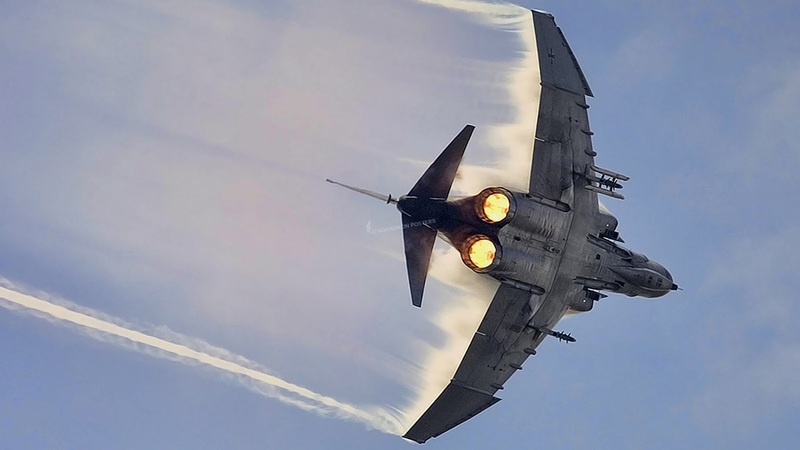 Missiles were all over the night sky as the fighters violently turned, afterburners flaring in the darkness. "Splash one!" Knight 12 called out. And then, a few seconds later, "Splash Two!" The first two MiGs were down. 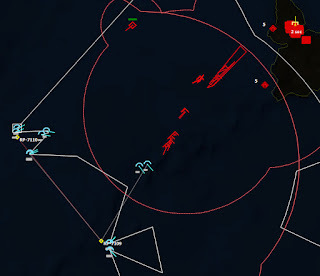 Two missiles were still tracking Jackson's fighter, but without their parent aircraft to provide radar guidance, they both lost lock and fell harmlessly to the ocean. Knight 12 still had an Apex closing in on it, and dodged hard, but the missile impacted the fuselage, tearing the fighter apart. Major Rogers turned back into the two remaining MiGs, realizing that if Knight 12 hadn't taken out the two Floggers, the pair of Apexes that had been chasing him could have still tracked and probably blotted him from the sky. His wingman had saved his life, and now he was determined to get his revenge on the two Floggers. Two the south, the Fencers launched their anti-radiation missiles at the Oriskany group. "Missiles inbound, break right!" Jackson yelled, and Rogers slammed the stick over again. This time they were on their own. Colonel Jackson has three missiles inbound...this is it. 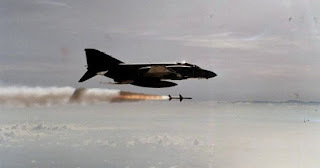 All three missiles soared by the Phantom and missed. And then two more Phantoms arrived. "Knight 32, Fox One! Fox One!" "Knight 22, Fox One! Fox One!" Only one MiG left, thought Major Rogers, as he finally achieved firing position. "Fox One! Fox One!" The first Sparrow took out the Flogger, and Jackson breathed a sigh of relief. Meanwhile, to the west, Knight 41 and 42 were calling their own shots as they fired at the Fencers. One by one they took down the attack aircraft, which had all already launched their missiles. 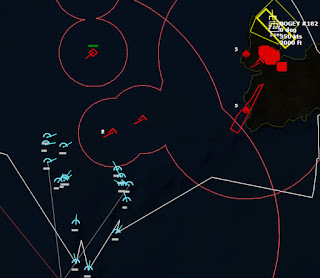 "Knights, Warning Star, be advised, more bogeys detected at Keflavik, count four, Flogger Bravos." The new flight of Floggers launched at Knight 51 and 52. 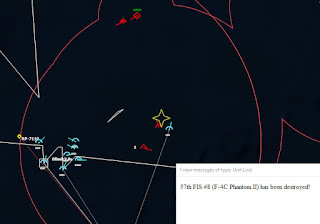 Both Phantoms dodged wildly and the four missiles missed. As they attempted to get into firing position, Major Rogers lined up and fired a pair of Sparrows. One impacted a Flogger, splashing it. Two down, he ticked off the kills in his head. To the east, Knight 22 launched Sidewinders at the rear pair of Floggers. Those Floggers launched Apexes at the approaching Knights 31 and 32. Again, missiles filled the night sky, searching for their targets. "Splash One MiG!" announced Knight 52. "Splash One Flogger!" called Knight 22. The four missiles headed for Knights 51 and 52, their launching aircraft either destroyed or maneuvering such that it was unable to illuminate their targets, all missed. Colonel Jackson studied his scope, and it was clear. In the quiet moment, he needed assess who was still capable of fighting and who needed to RTB. "Knights, Knight 11, say status." One by one the fighters called in their weapons and fuel states, and Jackson determined that he and Knights 21 and 22 would get on the tankers to refuel. The rest of the squadron would continue to patrol in case more Soviet aircraft took off. They would break off to refuel as necessary. The lead F-105Gs of the SEAD strikes were inbound. Glancing at the mission clock, Jackson noted that if anything, things were ahead of schedule. 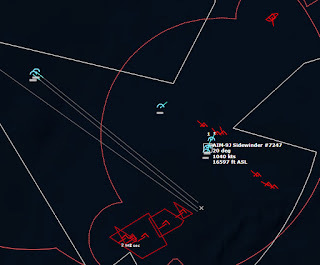 040248Z "Contact, Bogeys over Keflavik," came the warning from the Warning Star. And a moment later, Bogeys are classified as Flogger Bravos, two ship, and Fencer Bravo, four ship. The Phantoms converged on the new contacts, and soon missiles were in the air. 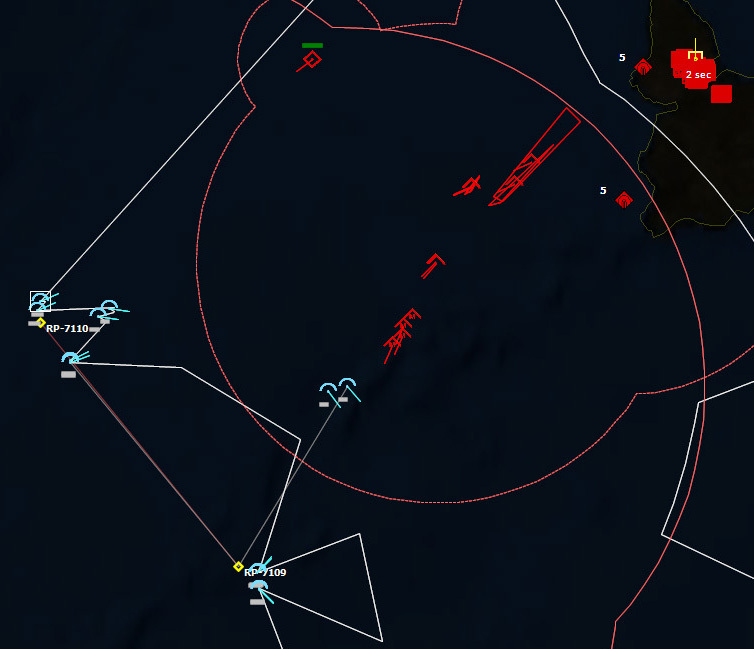 Knights 51 and 52 broke right to evade the four missiles headed their way. All four missiles missed, and the two Phantoms turned back in towards their targets. "Fox One!" Knight 51 called out, launching his first Sparrow. "Fox One!" he called again. "Fox One!" called his wingman, targeting the other Flogger. "Knights, Warning Star, more bogeys detected over Iceland." "Splash One Flogger!" called out Knight 51, and Knight 52 called out his kill seconds later. The two MiG-27M Floggers were down, and now the Phantoms swarmed the Fencers. In short order the Fencers were all shot down. Four more Floggers took off from Keflavik, two heading north, while two headed southwest. Knights 31 and 32 took care of the northern pair, while Knights 41, 42, 81 and 82 engaged the second. 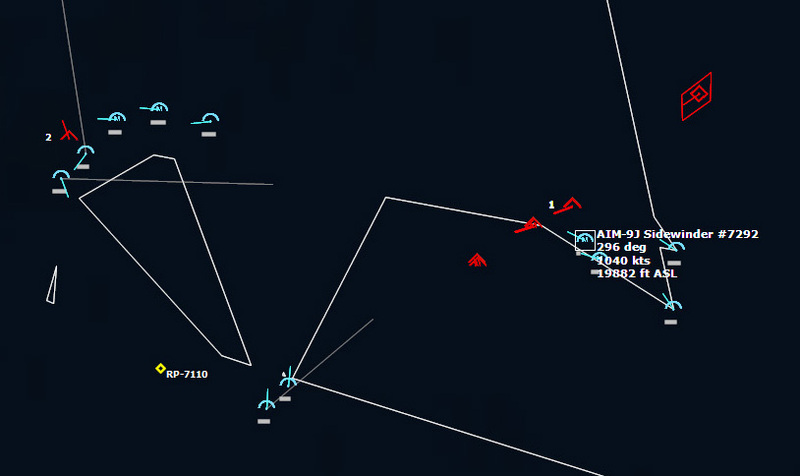 After dodging several radar-guided missiles, Knight 42 was shot down by an AA-8 Aphid. 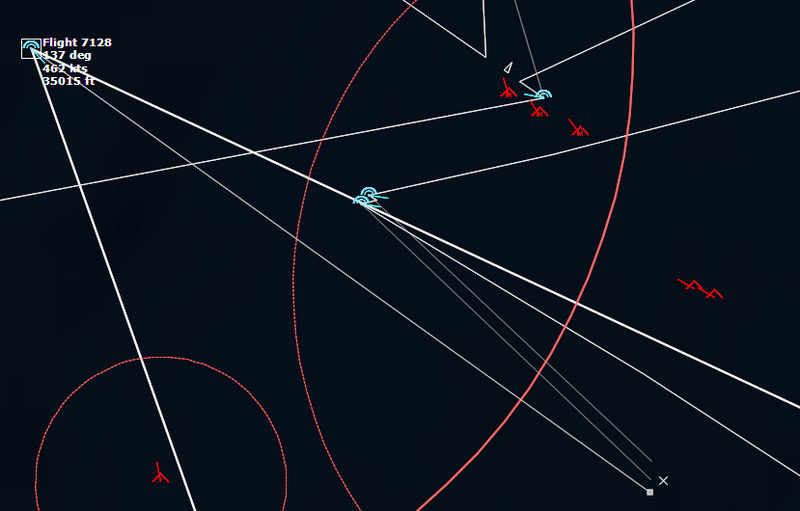 Almost unnoticed in the dogfighting above, a MRK Nanuchka far below launched an anti-ship missile towards the Oriskany group. The Phantoms began to fire Sparrows to take it out. 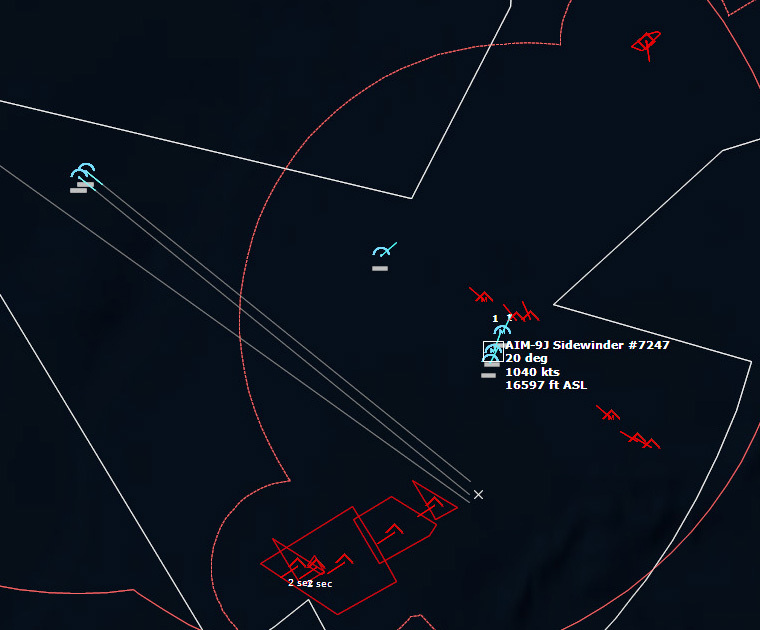 As the F-105Gs close in on Keflavik, two more MiG-23M Flogger Bs were detected lifting off from Keflavik. The F-4s were starting to get low on missiles, but then, the Soviets must surely be getting low on fighters.